It was a great weekend for American filmmaking. Gravity is a solid thriller, made by a great director, Alfonzo Cuaron, a man with a bold cinematic vision, backed by a fearless producer, David Heyman, who ushered Cuaron’s vision to the big screen, produced in collaboration with a huge studio, Warner Bros, who supported Gravity‘s vision and ushered it into theaters with a hugely effective marketing push. Miracle of miracles, the movie made a ton of money and will continue to do so. Because Gravity fulfills one of the essential qualities of commercial filmmaking in 2013: you gotta see it in a movie theater. This is a movie that will not be the same experience when you’re watching it on your phone while waiting in line at the grocery store. 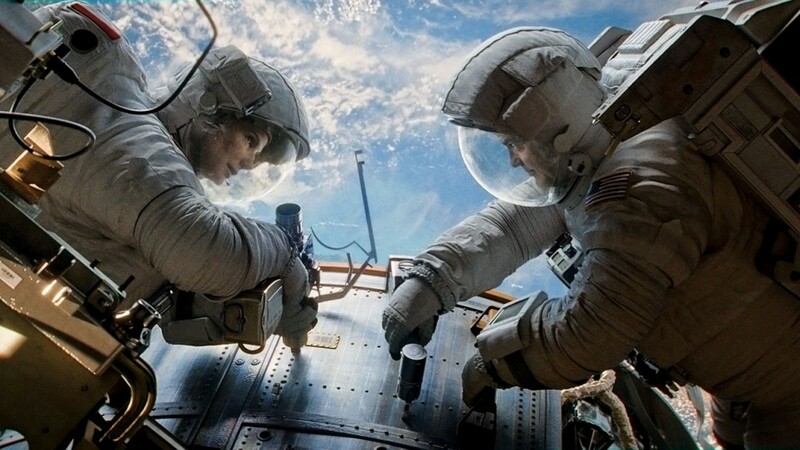 Here’s the thing: in an ideal world, Gravity would be an average American movie. Why isn’t it? Once upon a time, when I was a wee lad, Hollywood turned the reins of power over to talented directors, people like Stanley Kubrick and Bob Rafelson and Woody Allen and Roman Polanski and Francis Ford Coppola and Steven Spielberg and Martin Scorsese and Brian DePalma and Peter Bogdanovich and many others. The Second Golden Age of Hollywood, which lasted from roughly 1968 to 1980, followed the great wave of international filmmakers from the 1950s, Ingmar Bergman and Francois Truffaut and Federico Fellini and Michaelangelo Antonioni and Luis Bunuel and Satyajit Ray and Akira Kurosawa and Yosujro Ozu and many others. Around the world, directors, the people who actually made the movies, allowed to follow their visions. Some of the movies that came out of this director-driven wave were commercial smashes, some of them were self-indulgent disasters. Now, we are in the midst of what I’ll call a marketing-driven wave. This current wave differs from a studio-driven wave because back in the days of the studio system, the studio heads, for all their greed and marketing savvy, were still “show people.” You got to run a studio by starting out in the mailroom and working your way through the studio labyrinth. Now, studio heads are assigned from the corporate top, the decisions about which movies get made are made by people who have never made movies, who sometimes don’t understand movies, who sometimes don’t like movies. At which point I’ll say this: “Do you have the money to make this movie? If the answer is yes, don’t listen to anything I have to say, take your script, go and make your movie, don’t listen to me or anyone else, go and make exactly the movie you want to make and I will be first in line to see it.” And I’m totally serious. I love all those guys, Tarantino and Lynch and Kaufman and so forth. If you can make an unconventional movie, make an unconventional movie. And maybe your movie will be great and maybe not, but at least it will be your movie. But if you want someone else to pay to make your screenplay into a movie, you must learn to work within commercially acceptable forms, otherwise you are of no use to Hollywood and they will not hire you. It took me many years to fully understand a basic truth: movies get made by people who can get movies made. The person who can “get a movie made” is sometimes a star, sometimes a director with many hits under his or her belt, sometimes a powerful producer, sometimes a combination of these people, but the deciding vote is always cast by a high-ranking studio executive. If you can get a movie made, make a movie. If you can’t, you will be working for someone who can, and your personal vision will always, always be subordinate to theirs. It doesn’t matter how low-budget the movie is or how low the creative stakes are, if they’re the ones who can get a movie made, they will be the ones making the movie. They won’t care “what you want to say,” they can get a movie made and you cannot, the only thing that matters is what they want to say, and, in most of Hollywood, the people who can get movies made are an increasingly small number of studio executives with motivations geared toward a high-grossing opening weekend and a thousand other marketing concerns well beyond the scope of a lowly screenwriter trying to tell a compelling story. The bad news is that even people who aren’t that small number of studio executives have been trained to think like those executives, so that even producers of low-budget independent movies will still try to make their low-budget independent movies as much like studio product as possible, to make it fit a niche, to make it a cog that will fit into a slot, to make it a commodity. The low-budget independent producer behaves like a high-profile studio executive in the hopes of one day becoming one. None of them care for one millisecond “what you want to say.” You’re there to help them say what they want to say. All the filmmakers I’ve named above, all of them, got to the heights that they reached by finding powerful producers (and, occasionally, executives) who would stand by them and protect their visions. Some of them even got to express themselves within the studio system. Some of them enjoyed working within the studio system, others got out as soon as they could and formed their own companies. But their masterpieces didn’t get made by corporate fiat, they got made because those filmmakers could get those movies made. If you want to break the rules, figure out how to make movies and break all the rules you want. The good news is, making a movie is easier now than ever before in history. When I saw Shane Carruth’s Primer back in the day and heard it cost $7000 to make, I said “Well, that’s it, there’s no excuse anymore. If this guy can make a movie this good for that much money, nobody has any excuse anymore.” And that movie was even shot on film, something no independent filmmaker would do now. If you’re a young writer and you have a personal movie you want to make, get a camera, any camera, your damn iPhone if you want, get some friends and make your movie. Don’t submit your script to producers, don’t try to figure out how to gauge the marketplace, don’t listen to people like me who will suggest how to make it more formulaic and easy to understand, just make your movie, and that’s how you’ll learn how to tell stories cinematically. I wonder if filmmaking based on market considerations results in art. I’m a musician and the kinds of songs/albums/productions that get made in consideration of the market are no more than a product, a commercial endeavor. Yes, those can be made more or less artful, there are professionals involved who know (to some extent) what they are doing. But is it art? Does it express anything worthwhile? I feel it’s very similar in the filmmaking industry. Movies like “Ocean’s Eleven”, “Iron Man” or the Craig James Bonds provide wonderful entertainment made by professionals with a very high level of craft and love for what they’re doing. But I doubt that the term art applies. Filmmaking based on market considerations results in art all the time. An example is low-budget horror movies. Low-budget horror movies get made because of a simple marketing rule: there is a percentage of the filmgoing public who will go to see any horror movie. If you can keep your budget low enough, you can’t help but turn a profit. Because of this, there is always a market for a low-budget horror movie. And sure, some of them are disposable, but sometimes real art gets through. And I can think of dozens of examples from the music world of pop artists who ascended to the pinnacle of artistry while striving to fill a market niche. The early Beatles, for one, wanted nothing more than to be a successful pop act. They worked with their manager and producer to shape their sound and approach, make themselves more poppy and less sinister and less campy, which is what their stage act was at the time, and they did all this at a time when pop was tired and cliched and no one was looking for another pop group. They created their early masterworks through calculated market study and earnest application of tiny innovations that were designed to make their pop songs more catchy than other groups. If George Martin told them “You’ve got to have a hook in the first ten seconds or else radio won’t play it,” McCartney would say “Okay, then let’s have the hook be the first thing in the song,” and write “She Loves You.” I would say that everything the Beatles did up to Rubber Soul fills the definition of “art created to satisfy a market” and those records hold up quite well indeed. This comment contains spoilers for “To Rome with Love” and “Anything Else”. This comment isn’t about this post but a post Todd wrote years ago about Anything Else. It was about a theory that the movie was about time travel and Woody’s character was visiting his younger self, Jason Biggs. Have you seen To Rome with Love? It pretty much confirms the theory, because Woody is telling the same story again but making it much more explicit. Alec Baldwin is visiting his younger self, Jesse Eisenberg. Maybe Woody was bummed out that so few people understood Anything Else, so he told the story again but more obvious.